The Hong Kong Dolphin Conservation Society has warned that the planned marine park off North Lantau may already too late to save the local Chinese white dolphin population. Chief Executive CY Leung confirmed in his policy agenda, issued with his policy address last week, the government was moving forward to establish the park around the Brothers Islands. Dolphin Society chairman Samuel Hung told Apple Daily dolphins in the North Lantau waters were “nearly extinct” – only one was sighted in the area last year. Ten years ago an average of 20 or more could be seen each day. Last year the level of dolphin activity several times fell so low that it breached levels that could have brought Hong Kong-Zhuhai-Macau bridge construction to a halt. Three times it fell through the so-called “limit level,” representing a 60% fall in numbers, three times, which can mean the cessation of all project work. However, in each case an inspection report denied that the population decline was linked to the bridge construction. Dolphin numbers also twice broke the “action level,” or a 30% decline, requiring the EPD to discover the reason for the fall, but again no link to the bridge was found. The Apple Daily reports that the new marine park could be set up as early as the end of the year, setting a daily limit of 50 vessels permitted to enter the zone. But Hung says the park waters are a continual construction site. Now it’s the Macau bridge and the Tung Chung reclamation, then there will be the airport third runway and Sunny Bay reclamation. 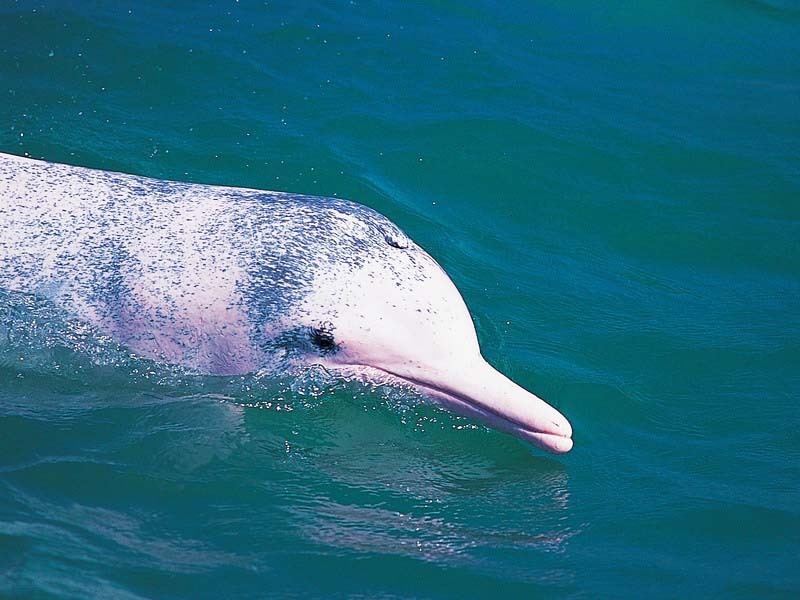 The Chinese White Dolphin is listed as “near-threatened” in the IUCN Red List of Threatened Species.